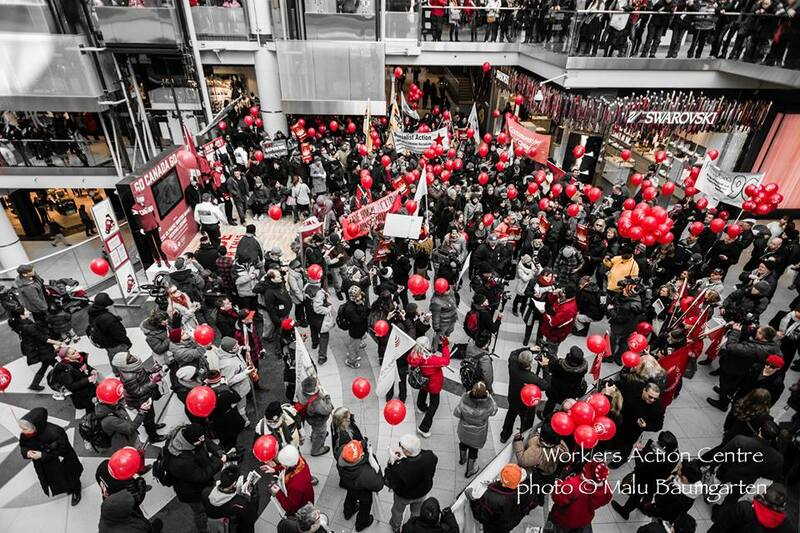 Rally for fair wages takes over Eaton Centre! 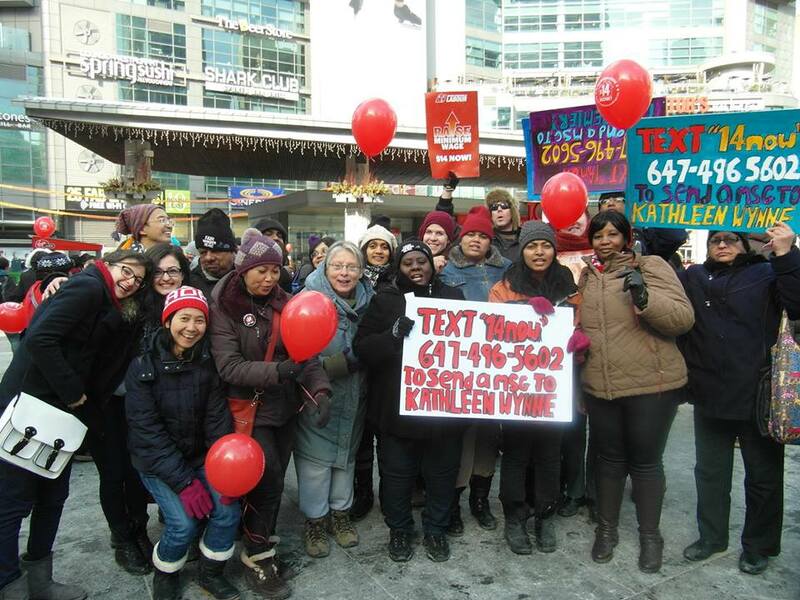 This past Family Day weekend, communities across Ontario sent a strong message to our elected officials and to Premier Kathleen Wynne that Ontario families need decent work and wages in a day of action organized by the Campaign to Raise the Minimum Wage. Just two weeks after Kathleen Wynne promised a 75-cent increase to the minimum wage and indexation, campaign supporters organized vibrant and creative actions to re-affirm the call for a $14 minimum wage and good jobs in our communities. The Ontario Federation of Labour helped launch an interactive text tool at each action which made it possible for hundreds of supporters to send messages to all three party leaders. It’s not too late to add your voice! Text “14now” to 647-496-5602 to send a message directly to all three party leaders that Ontario families deserve fair wages! 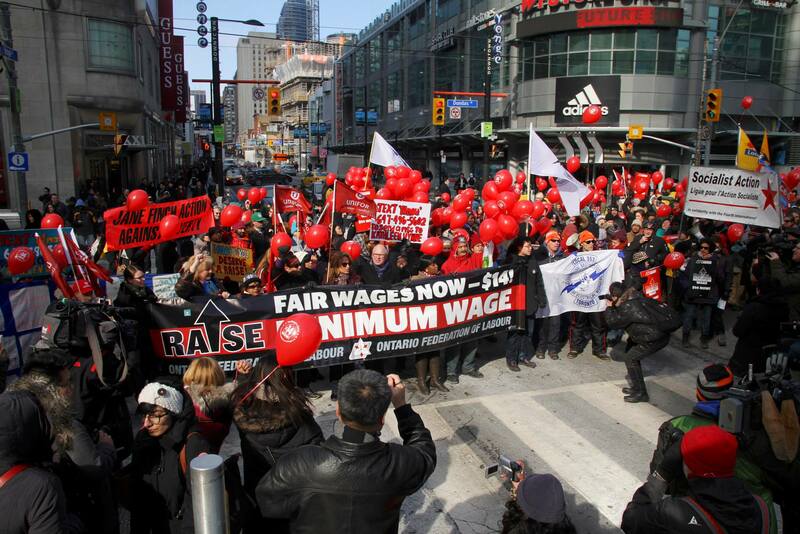 The Ontario Federation of Labour and the Ontario Common Front worked with the Campaign to Raise the Minimum Wage to organize a rally in the heart of Toronto’s retail sector at Yonge Dundas Square. Hundreds of supporters came out to show their support for a $14 minimum wage and decent work. WAC members and our friends from the Caregivers Action Centre raising our voices to send a message to party leaders. WAC member Pinky Paglingayen telling the crowd why we need dignity and respect for our families with fair wages and decent work. 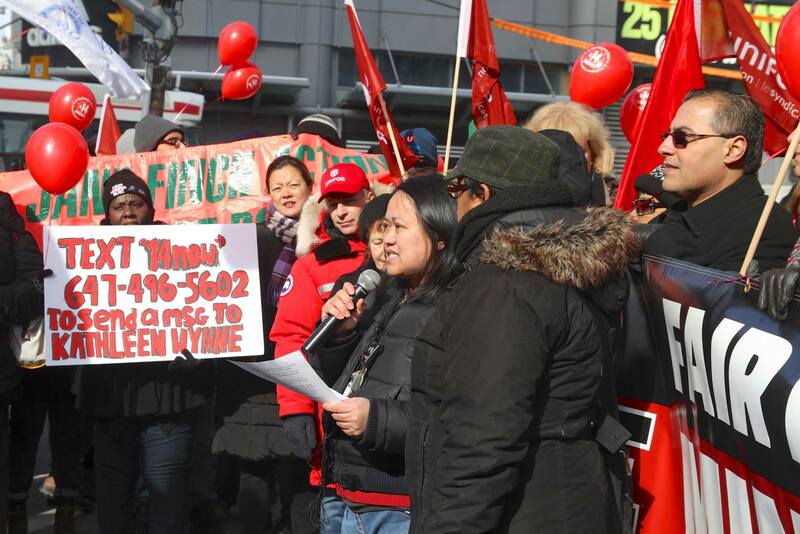 Other powerful speakers included Andria Babbington from the Toronto and York Region Labour Council, Jenny Ahn from Unifor and Sid Ryan from the Ontario Federation of Labour. We took over the Yonge & Dundas intersection! Look at the attention we got from shoppers! We heard lots of cheers from retail workers too. 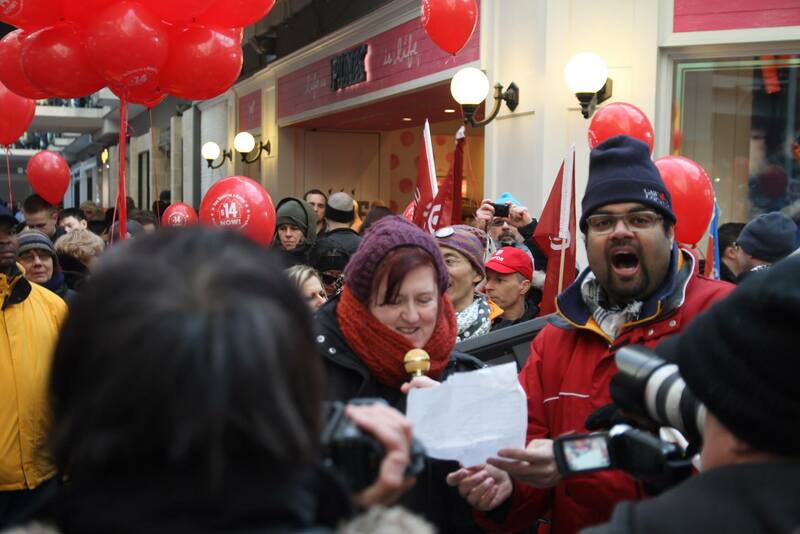 WAC member Lorraine Ferns and Chris Ramsaroop from Justice for Migrant Workers led a mic check action inside the Eaton’s Centre in which the whole crowd raised their voices to demand $14 now and decent work for Ontario families! Everyone left feeling empowered, energized and pumped for the next steps of the campaign! Thank you to everyone who joined us at this exciting day of action. The fight continues! Public Services are Women’s Services! GenSqueezed: We Demand our Future!